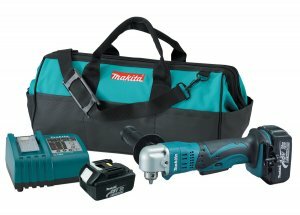 The new right angle drill from Makita, again builds from Makita's ever growing line of 18volt LXT Lithium-Ion tools. The BDA350 Cordless Angle Drill is a must have for anyone that frequents close combat drilling. The BDA350 uses a Makita 4-pole motor that delivers the speed and power in a compact size, giving this tool an excellent power-to-weight ratio. Up to 1,800 RPM's, and 121 in.lbs. of torque worth of power to be exact. With the use of a keyed chuck, Makita was able to get the head size to only 2-5/8". Of course the drill also feature an LED light, for greater visibility.